It is a fact that not every street in the Netherlands has separated cycle paths. It is also true that Dutch traffic experts do sometimes say that in road building they only “separate where needed” and “mix where possible”. These two facts combined are cause for one of the great misunderstandings of the Dutch road building system. “Even a Dutch cyclist will have to ride with motorized traffic one time or another, because cycle paths simply can’t go everywhere.” This probably comes right after the great misunderstanding of ‘strict liability’ when that is assumed to ‘magically’ bring road safety to vulnerable road users in the Netherlands. I have argued before that what keeps Dutch vulnerable road users safe is the system of ‘sustainable safety’ and the categorization of streets and roads under that system. A large part of the streets in the Netherlands is designated as ‘area where people want or need to be’. In those streets it is not the car but the human who is king of the road. The areas are mostly residential but also commercial, and the streets in those areas have a maximum speed limit of 30 km/h (18mph) and that makes it very possible to ‘mix’ different types of traffic there. Never is traffic ‘mixed’ on through streets with high volume traffic at high(er) speeds. There traffic will always be separated. So what does this policy mean on the actual roads? 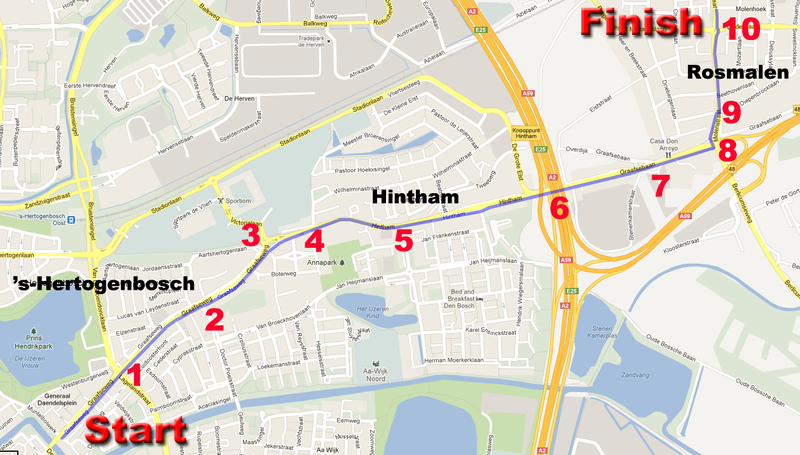 Map showing the 4 kilometer route from ‘s-Hertogenbosch via Hintham to Rosmalen. The numbers correspond with events I describe in the post. The video below shows a route from the edge of the historic city center of ’s-Hertogenbosch to the former town of Rosmalen that became part of the ’s-Hertogenbosch municipality only in 1996. The route is 4 kilometers long and for the larger part there are no separated cycle paths. In fact on only about 1 kilometer of the route or 25% there are separated cycle paths. So does that mean I have to cycle with traffic? Not exactly! On the entire route there is only one interaction with a motorized vehicle (2) and that car driver gives me priority as he should. Twice I have to deal with two cyclists riding the wrong way (1, 5) but I can do so without stopping. In fact, as you can see, I can ride the 4 kilometers without having to stop once*. There are two junctions with traffic lights (1, 8) but I have a green light twice. I only have to give way to motorized traffic once (9), but there is no car coming when I arrive at that point. I have to give way to other cyclists twice at junctions (8, 9) but no other cyclists are there either. The third and last time I have to give way to other cyclists is on entering the roundabout (10). I pass an enormous building site (7) but (apart from old fashioned road surface) I hardly notice it. I bypass a roundabout (3) and underpass a motorway (6) almost without noticing it. This all is possible because where I ‘mix with traffic’ the streets are residential streets and not through streets. They are service streets next to a main road and they were (re)constructed as cycle streets where cyclists have priority. The fact that only residents use those streets makes the number car movements very low. So low that on the entire ‘mixed’ part of the route I do not have to interact with a single car. And I filmed this between 5 and 6 in the evening, so at a time that many people could return from their daily business. A Google Map with the entire route. If you are really interested and have a lot of time you could watch the real time long version of this video. At the building site a canal is being constructed. It is the relocation of a canal that now goes right through the center of ‘s-Hertogenbosch. 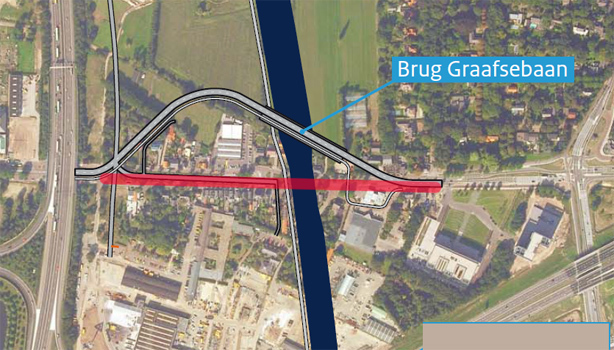 When the canal is finished a part of the through route will have been diverted. Some houses will then not be on the through route anymore. The red line shows the building site area. The streets there have not been updated yet and show you an older type of road design that was already separating through traffic but with a type of surface that is not considered acceptable for a main cycle route anymore. The new road with a bridge over the to be constructed canal will be at a different location further away from some homes. 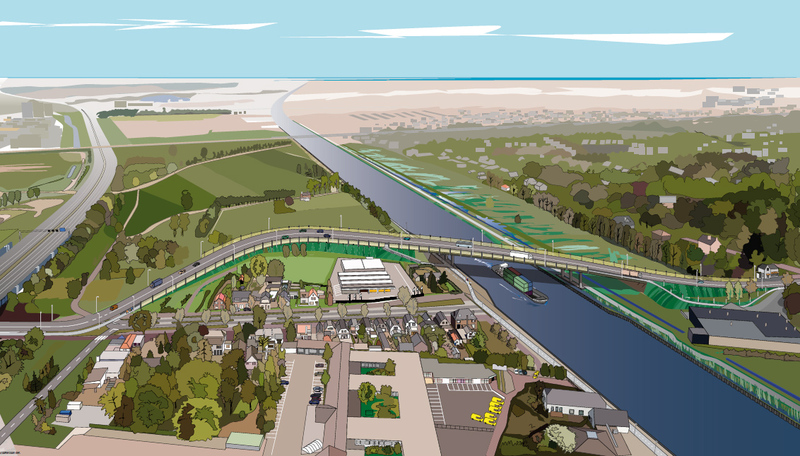 An artist’s impression of the finished canal, with new bridge and bypass. I knew that all (nearly all?) residential streets were 30 km/h, but are all or most commercial streets also 30 km/h? Most streets with many shops in the centers of the Dutch cities are pedestrianized, so there is no motorized traffic possible at all. But streets like this one with shops in the adjacent service street makes that those shops are indeed in a 30km/h zone. The big box shops are usually found all together in zones on the outside of cities. These shop zones are usually also made 30km/h. I really like the multi-way boulevard design with the side access streets for local travel and bicyclists. We have very few well designed examples of these in the US, but I wonder if they are key to providing good bicycle access on our arterials. In particular, I love the example of Graafseweg, with only two center travel lanes. Is there any way to find out the traffic volumes on a street such as that? How many cars per day could this accommodate? On the approach to the new bridge, does the path bow out from the roadway on the right side of the canal as a means to reduce the grade cyclists have to climb to reach the apex of the bridge? That could be the reason yes. But it also follows the road as it is today because that went around a petrol station, now removed for the building activities. It could simply be that that terrain is owned by someone else than the road manager. Great post as always Mark. Can you explain why a number of parked cars to the left of picture in Hintham (around 3.20 mins into the video) seem to be parked facing towards the rider? Is the service lane bidirectional? I’d have thought it would have been one way, the same direction as you were riding (and the adjacent main road traffic lane)… and so would not have expected cars to be parking facing the ‘wrong’ direction. From 3:16 to 3:39 it is indeed a bidirectional service street, so cars are parked facing the rider but also a couple of cyclists cycle in the opposite direction which is perfectly okay there.It is not clearly indicated though. I agree with that. 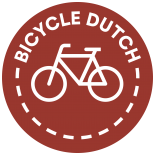 This entry was posted on 9 August 2012 by Bicycle Dutch in Original posts and tagged ’s-Hertogenbosch (Den Bosch), infrastructure, separation, unbundling.